Here are five quick facts about Ademola Adeleke, a serving Senator and Osun PDP governorship candidate. Ademola Adeleke has been elected the candidate of the Peoples Democratic Party, PDP, by delegates across 332 wards ahead of the Osun state governorship election. Before his emergence as the PDP flagbearer for Osun state governorship election, Adeleke became famous for his dance steps at the slightest opportunity. However, not much is known about the personality of Adeleke, the man in whom Osun PDP has entrusted its fate to succeed Aregbesola. 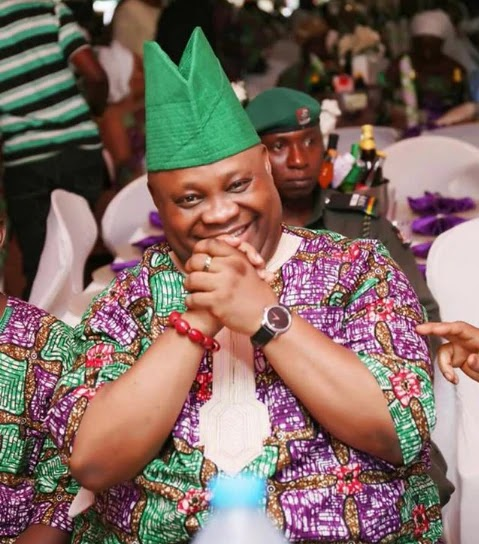 Here are five quick facts about Ademola Adeleke, the senator representing Osun West senatorial district and Osun PDP governorship candidate. Senator Ademola Adeleke was born on May 13, 1960 but only a few know that he was born in Enugu state - South East Nigeria. However, Adeleke's parents moved to Lagos, where he attended the Methodist Primary School in Surulere, Lagos. Only few individuals close to the Senator widely referred to as dancing senator know this. Unknown to many political observers outside Osun state, Adeleke's mum was an Igbo woman with a Christian background. Her name was Esther Nnena Adeleke and she hails from Enugu State. The Senator's good looks have been attributed to his mum's beauty. Interestingly, Adeleke is not the first Senator in his family neither is he the second but the third. The first Senator in the Adeleke family is the patriarch of the clan, Raji Ayoola Adeleke. Ademola's father, who was the Balogun of Ede, was an astute politician and a second Republic Senator. Ademola's dad was one of the major political pillars of the defunct Unity Party of Nigeria, UPN, where he worked alongside the legendary premier of Western Nigeria, Chief Obafemi Awolowo. Ademola became a Senator after he replaced his late brother, Isiaka Adeleke, to represent Osun West senatorial district at the Nigerian Senate in 2017. The move to replace the late Isiaka saw Ademola quiting the All Progressive Congress, APC, to join the Peoples Democratic Party, PDP, where he emerged the candidate and won the by-election. Ademola Adeleke is the father of two Nigerian musicians named B-Red and Shina Rambo. The two music acts are signed to the Adeleke owned recording label, HKN Music, which also has top pop act, Davido, on its wings. Adeleke is also Davido's uncle - he's actually the youngest of the Adeleke brothers that include Isiaka and Adedeji Adeleke. After his primary school in Lagos, Adeleke also attended Nawarudeen Primary School, Ikire. He progressed to The Seventh Day Adventist Secondary School, Ede and later moved to Muslim Grammar School Ede after which he left Nigeria for Alabama in the United States of America. Adeleke studied Criminology at Jacksonville State University in Alabama. After he completed his education at the Jacksonville State University, he worked at Quicksilver Courier Company and Origin International LLC in Atlanta, Georgia, USA. He also worked with Guinness Nigeria for six years before joining his brother's conglomerate, Pacific Holdings Limited.